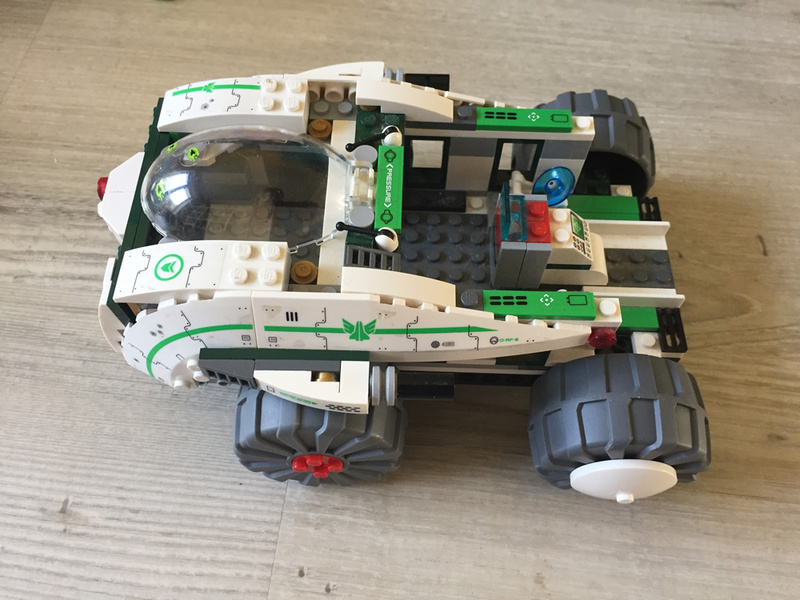 Can you identify this LEGO space set? I've just purchased a random box of Star Wars LEGO at a car boot sale and there's a few bits in there that I'd like to identify the set for. It's not a Star Wars set, it's most of the main part from "70704 Vermin Vaporizer" from the Galaxy Squad theme. The word "pressure" on the green tile hints that it's not Star Wars, as that would normally be in Aurebesh - the written script you see in the films. It turns out the curved white roof tile (Circle 90G 6X6 Roof Tile) at the front was only used in three sets, which helps identify it. Not the answer you're looking for? Browse other questions tagged set-identification space or ask your own question. What lego set is this? Possibly a pirate ship? Can you help identify my new LEGO set? Can you identify this old set with LEGOLAND minifigs? Which set did this Technic assembly come from? Help! Unidentified #2 bag 2007!